Pipette calibrations are an important and vital part of the laboratory quality management practice. The process requires precise accuracy measurements with very small volumes of liquids. Any discrepancy in volumes dispensed will affect the results of an experiment. Does your organization perform Pipette Calibrations?? Accuracy and Precision in Pipette Measurement is a Must! 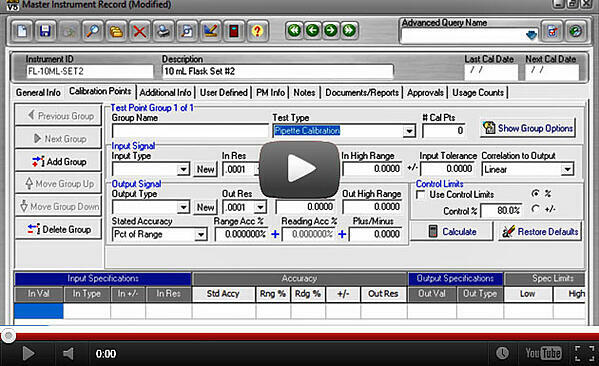 Users can capture multiple repeated volumes and weight measurements for each Pipette test. Each set of readings is tested for precision (%RSD) and Accuracy (% of target volume). Convert the corresponding volume according to an entered temperature value using a water density factor table. Automatically convert from milliliter and microliter to milligrams or grams. Watch the Video and Learn More Advantages! PCX Starter is designed to provide the fundamentals of a good calibration management system that is optimized for users who often use 3rd party calibration suppliers, but sufficient for those who perform their calibrations in-house. With very few required fields, the system is set up for easy data entry to capture the essentials necessary to keep your calibrations on track as a web-based cloud-hosted calibration software solution. And the interface is all accessible from anywhere in the world via the internet, using your browser and hosted in a secure cloud environment. Explore the Benefits and Get a Free 60-Day Subscription!